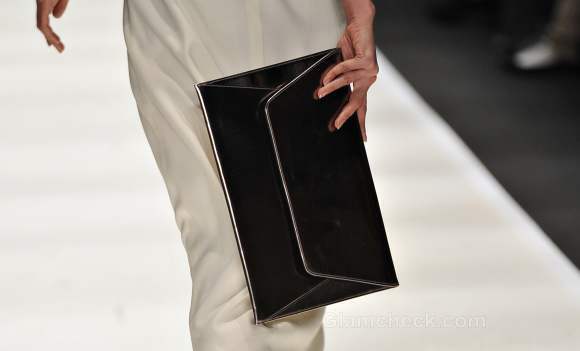 Eternally stylish envelope clutches appeared on the ramps yet again, witnessed at the Basharatian Fall winter 2012 collection presentation during Mercedes Benz Fashion week held on March 25, 2012 in Moscow, Russia. The dazzling silverfish-black over-sized clutch carried by the models, was a vital “oh-so-chic” accessory and that’s why its our style pick of the day. Bashartian collection was a “glam-meets-mod” blend to have a futuristic appeal. Among a play of neutral shades, the PVC clothing and the envelope clutches added just the right note for sophisticated glamor. The flat envelope clutch exuded feminity yet kept the vibe casual. 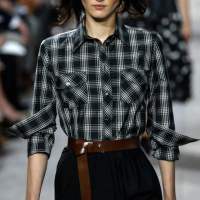 Its sleek, geometric shape complimented the clean lines of the ensembles. Envelope clutches are a rage and are a perfect companion to this season’s luxe looks. Carry an envelope clutch and let your style be at its effortless best. Breaking the monotony of the structured clutches, envelope clutches can be carried in any size and color. They are stark and slick, and go with any kind of outfit whether formal or casual. Even an envelope clutch in a solid boring hue, is enough to speak for itself. With an envelope clutch, you can pocket each of your knick-knacks along with your phone, wallet or your everyday essentials. Its big size has room for everything. They are practical and easy to open and have no bulky element in them. Size with the envelope clutch does matter, and in this case the bigger the better it is! So, whether its a bar, a club, a dinner or a mall you are heading out too an envelope clutch can make a difference to each outfit set for any occasion.